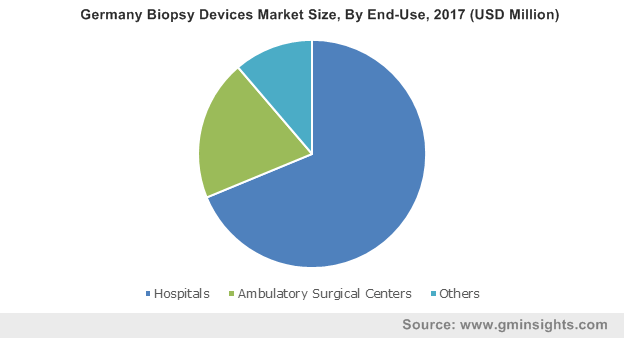 Biopsy Devices Market size was valued at USD 1.9 billion in 2017 and is expected to witness growth of over 6.5% CAGR from 2018 to 2024. 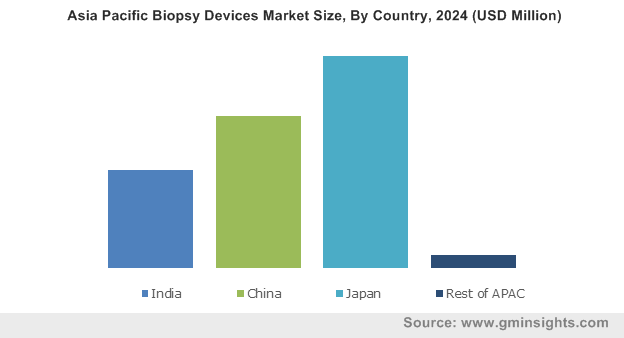 Rising prevalence of cancer and infections will stimulate biopsy devices market growth over the forthcoming period. Infectious diseases are rapidly emerging worldwide due to changing environmental conditions and rising population. According to World Health Organization, 50,000 people worldwide die from infectious diseases. In addition, infections with new and unknown causative agents have increased tremendously during recent years. Biopsy is thus a crucial tool for histopathological examination of tissue. Rising number of kidney disorders, infections and rising cancer incidence should increase the market size over the upcoming period. Technological advancements in biopsy devices will lead to faster adoption of biopsy devices in coming years. Conventional biopsy for prostate biopsy without using imaging guidance technology render negative tests or misses tumor in maximum cases. Thus, evolution of technologies such as MRI/ultrasound for accurate and reliable diagnosis of lesions is leading to faster adoption of biopsy procedures. Koelis developed Organ-Based Tracking (OBT) Revolution that works in tandem with elastic fusion technology, thus maximizing accuracy of the procedure. Such innovations allowing better and improved diagnosis of abnormalities will drive global biopsy devices industry over the upcoming period. 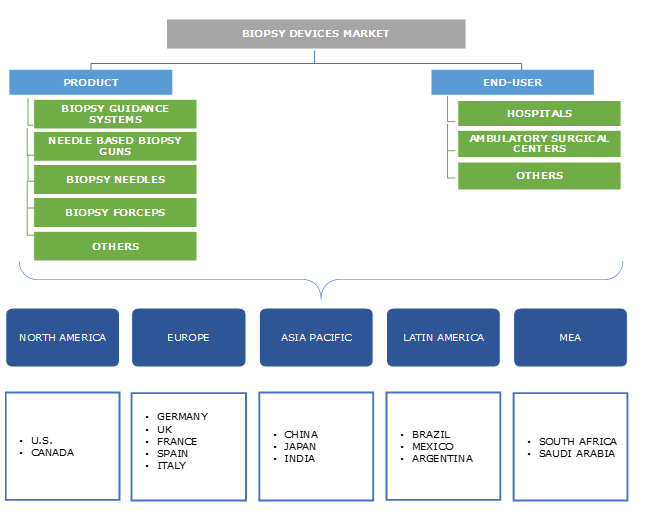 Biopsy guidance systems segment accounted for largest revenue size of USD 855.4 million in 2017. As per data from Journal of Clinical Pathways, during the recent years, more than half biopsies were guided by computed tomography systems and other procedures such as ultrasound/fluoroscopy. Guidance systems offer high-definition images of the abnormalities/tissue, are minimally invasive as well as cost-effective. In addition, several companies are concentrating on R&D to innovate newer imaging technologies that should impel biopsy guidance systems segment growth over the forecast timeframe. 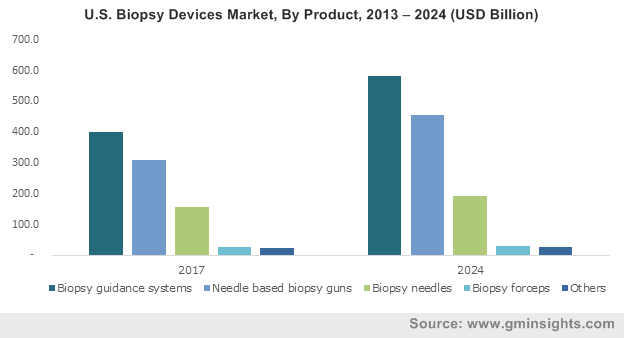 Needle based biopsy guns segment is forecasted to grow at 7.2% CAGR during the forecast period. Fine needle aspiration (FNA) is minimally invasive procedure and requires extraction of only fewer cells for diagnosis. Needle-based biopsy is reliable and offers accurate diagnosis of the abnormalities/disease. Above benefits of needle-based biopsy guns coupled with increasing demand for minimally invasive procedures will spur segmental growth. U.S. market accounted for highest revenue share of 81.0% North America biopsy devices market in 2017. Expanding cases of cancer coupled with growing awareness of cancer diagnosis and treatment in the country is estimated to offer accelerating demand for biopsy devices in future. For instance, October is considered as the breast cancer awareness month, wherein rallies, breast-cancer awareness campaigns and events are held. Furthermore, sophisticated healthcare infrastructure and growing prevalence of infections will positively impact U.S. biopsy devices industry growth over the projected timeframe. France market will grow at remarkable pace of 6.2% throughout the forecast period. Growing incidence of cancer will act as a high impacting factor for France market growth. According to Cancer Organisation Soutien, 385,000 new cases of cancer were diagnosed in France in the year 2015 and incidence of cancer is increasing considerably. In addition, breast cancer is the leading cause of mortality in women. With such accelerating pervasiveness of cancer, France biopsy devices will foresee lucrative growth over forthcoming years. Major market players operating in global biopsy devices industry are Hologic, C.R. Bard, Inc., Devicor Medical Products, Inc., CareFusion Corporation among other players. Companies are undertaking strategies such as product launch through technological innovations and partnerships to reap profits in the industry. For instance, in August 2017, Hologic launched Brevera breast biopsy system with CorLumina imaging technology, innovative technology for fast verification of tissue-samples. The strategy aimed at broadening company’s product base and attract new customers. Biopsy was formerly performed in Russia by M. M. Rudnev in 1875 followed by first breast biopsy performed during 1850s by Skey, Sr. James Paget, John Eric Erichsen and Prtichard. The evolution of first biopsy needle can be dated back to early 1930s. During 1981, analog mammography system Mammomat B by Siemens Healthineers offered biopsy paddle for localization of needle under mammography supervision. Subsequent developments in other biopsy types such as prostate biopsy, renal biopsy and infections through technological advancements including imaging-guided biopsy marked robust industrial growth. Additionally, renal biopsy will foresee lucrative growth opportunity as a result of rapid developments in imaging technologies including Magnetic particle imaging (MPI) modality that allows localization of localization of super paramagnetic nanoparticles at high resolution. Such advancements are forecasted to spur biopsy devices industrial growth in foreseeable future.